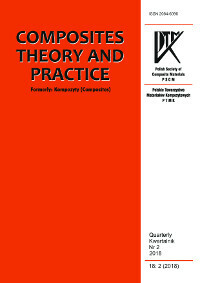 The Composites Theory and Practice Journal constitutes a medium for the publication of theoretical and experimental studies and reviews on fabrication techniques, structure, properties, behaviour and engineering applications of a wide range of composite materials. The Journal publishes original (research and technological) manuscripts and, occasionally, reviews on all aspects of composite materials science and technology. The Editors accept papers throughout the calendar year. All papers submitted to the Journal are subjected to a thorough peer reviewing process. The prerequisites for accepting articles for publication is to prepare the work in accordance with the requirements of the Journal and to obtain positive reviews. Before submitting a paper, an Author must prepare it according to the Guidelines for Authors. become familiar with the provisions regarding ethics in publishing. By submitting an article to the journal, Authors automatically declare that the work is consistent with the principles against ghostwriting, guest authorship and plagiarism. Each paper submitted to the Journal is subject to preliminary verification by the Editors for compliance with the Journal requirements (the topic and correct preparation of the paper according to the Guidelines for Authors). If the paper does not satisfy the basic requirements, the Author will be requested to revise the paper and resubmit it. * All the papers (in PDF format) are sent to Reviewers. The Journal Reviewers are specialists in composite materials, materials engineering and related sciences (Reviewers are always selected from other institutions than the Authors of the paper).The decision to appoint a reviewer belongs only to the Editor. The reviewers for particular papers are appointed by the Editor-in-Chief (himself or having sought the opinion of the Section Editors) depending on the detailed topic of the submitted paper. Each Reviewer is asked to prepare an opinion on the paper on the standard Review form (available for Reviewers online in electronic format after logging into the system). * The Reviewer can present his / her comments in a descriptive form and classifies the paper as: accepted in the present form, in need of minor revision, in need of major revision or rejected. The Reviewer also has the right to request the paper to be submitted to him / her again after revisions for repeated review and acceptance. * The Author (or Co-author – named as the contact person to receive correspondence) receives reviews (without the Reviewers’ names) in PDF format. Where a revision is required, the authors are required to respond in detail to the Editor's, Editorial Office's and Reviewer's comments (by sending to the Editor) and to make corrections to the manuscript. In cases of dispute (including possible rejection of the manuscript) or at the author's request, the decision is taken by the Editors (with the final decision belonging to the Editor-in-Chief), who can appoint further reviewers if necessary. * If the review is positive or the paper is submitted after corrections according to the Reviewers’ and Editor's remarks, the paper is referred to a further editorial procedure. * Each paper is proofread by a specialist native speaker of English. After proofreading the Author receives the corrected paper for acceptance of the corrections, remarks and suggestions of the proofreader. * After the language proofreading and acceptance thereof by the Author, technical proofreading is done by the technical proofreader, then the text is typeset and formatted and all the papers submitted to the particular issue are subject to final technical proofreading. (In case of any doubt arising during technical proofreading or typesetting and formatting of a particular paper, the Coordinating Editor contacts the Author again). * Finally the whole issue goes to press and after its publication the particular papers are made available online (in PDF format) on the Journal website. The order in which the papers are printed in the particular issue / publishing year depends both on the date of submission to the Editors and on how fast the paper undergoes the whole procedure as described above. Submitting an article to the Journal is tantamount to expressing consent to publication in both paper and electronic form. By submitting the manuscript, the Authors automatically agree to the processing of the personal data provided by the Editors and Publishing House. The ethics rules for the Composites Theory and Practice journal are based on the Best Practice Guidelines for Journal Editors issued by the Committee for Publishing Ethics (COPE). An editor of a reviewed journal is responsible for making decisions which articles should be published, and in addition be responsible for all publications in the journal. By making these decisions, an editor may be guided by the editorial policy of the journal, as well as the legal requirements for libel, copyright infringement and plagiarism. An editor may communicate with other editors or reviewers when making a decision about publication. An editor should evaluate manuscripts for intellectual content and follow the COPE guidelines for withdrawing articles. The editor shall not disclose any information about the manuscript he considers to anyone except the authors, reviewers and potential reviewers, and in some cases - members of the editorial board, as deemed appropriate. Unpublished materials contained in the submitted manuscript cannot be used in the editor's own research. Valuable information or ideas obtained as a result of evaluation of the work must be confidential and cannot be used for personal gain. The editor undertakes to ensure that advertising, reprinting or other commercial revenues do not affect editorial decisions. The editor should strive to ensure a fair and proper review process. The editor should require all colleagues to disclose relevant conflicting interests. Reviewing helps the editor in making editorial decisions, and through editorial communication with the author, can also help the author improve the manuscript. Any invited reviewer who does not feel competent to review the research reported in the article or knows that its timely execution will be impossible, should immediately notify the editor so that alternative reviewers can be contacted. All manuscripts received for review must be treated as confidential documents. They must not be shown or discussed with other people unless permitted by the editor. Reviews should be processed objectively. Personal criticism of the author is unacceptable. Reviewers should clearly express their views using appropriate supporting arguments. The reviewer should also draw the Editor's attention to any significant similarities or overlaps between the manuscripts under consideration and any other published data about which he has personal knowledge. Privileged information or ideas obtained as a result of the assessment must be confidential and cannot be used for personal gain. Reviewers should not judge manuscripts in the event of a conflict of interest, including those resulting from competitive cooperation or other relationships or connections with any of the authors, a company or institution related to the manuscript. Authors reporting the results of original research should provide a detailed description of the performed work and an objective discussion about its significance. Fraudulent or knowingly inaccurate statements constitute unethical behavior and are unacceptable. Authors should ensure that they have written entirely original works and if they have used the work and/or words of other people, that they have been quoted appropriately. The author should not publish manuscripts describing basically the same research in more than one journal or original publication. Parallel submission of the same manuscript to more than one journal is considered as unethical publication behavior and is unacceptable. Proper recognition of the work of others must always be granted. The authors should also cite publications that influenced the inspiration and determined the nature of the submitted work. Authorship should be limited to persons who have made a significant contribution to the concept, design, performance or interpretation of the results of the submitted manuscript. All those who have made a significant contribution should be listed as co-authors. If there are other people who have participated in certain aspects of the research project, they should be listed in the Acknowledgments section. The author for correspondence should ensure that all the relevant co-authors (as defined above) are listed and no inappropriate co-authors are included in the list of authors of the manuscript. He/she must also ensure that all the co-authors approved the final version of the article and agreed to submit it for publication. All authors should disclose in their manuscripts all financial or other conflicts of interest that can be interpreted as affecting the results or their interpretation in the manuscript. All sources of financial support for work should be indicated. When the author discovers a significant error or inaccuracy in his own published work, it is the responsibility of the author to immediately notify the editor or publisher of the journal and to cooperate to withdraw the article or to publish an appropriate errata. In cases of alleged or proven scientific abuse, fraudulent publication or plagiarism, the publisher, in close cooperation with the editors, will take all appropriate measures to clarify the situation and change the article. This includes a quick errata publication or, in the most severe cases, complete withdrawal of the paper. Printed version of the Journal is its original. The paper presents an attempt to estimate the difference in the intensity of the curing process of a polyester resin: without any filler and filled with fragmented glass fabric. Curing of the resin samples was carried out at room temperature. The temperature-time course of the process and gel time were recorded for each sample. On the basis of the obtained results and the conducted observations, it was found that filling the resin with fragmented glass fabric caused a decrease in the peak temperature of the curing process and increased the time of reaching this temperature. These effects were found to intensify with an increase in filler weight (inhibitory effect of the filler). A slightly longer gelation time was also found for the filled resin in comparison to the unfilled one. The observed effects indicate an increase in the thermal insulation of the curing mass along with an increase in filler content. They also indicate that the presence of fibers leads to stabilization (improvement of repeatability) of the resin curing process. The work is a continuation of earlier work aimed at experimental evaluation of the behavior of curing resins, which in turn will help to systematize the practical knowledge in this field. Thus, it finally meets the expectations of users and processors of curable resins. The aim of this work is to examine the effect of the layer configuration (lay-up) of carbon 3k/IMP503Z40 epoxy composite elements on the specific energy absorption (SEA) effect in the process of progressive crushing of composite tubes. Composite tubes made of Impregnatex Compositi prepreg with a dry areal weight of 160 g/m2 plain weave and unidirectional prepreg (UD) 200 g/m2 on an epoxy matrix were tested. The resin content in both prepregs was 47%. Using these two materials, tubes with different ratios of axial and hoop fibers, in two sizes with an inner diameter of 42 and 20 mm while maintaining a constant ratio of wall thickness to a diameter of 0.05 were made. The samples were unilaterally chamfered at the angle of 70°. Then, tests of progressive crushing of the samples under dynamic conditions by means of a drop tower and an additional initiator were performed. A new factor was introduced to describe the mass fraction of the axial fibers. SEA was calculated, which indicated that the higher the share of axial fibers, the greater the SEA for both types of samples and it was indicated that there may be a scale effect. The self-heating effect occurring during the fatigue loading of polymeric composite structures subjected to cyclic loading or vibration is a result of energy dissipation appearing due to the viscoelastic properties of the matrix of such composites. The occurrence of the self-heating effect during the operation of structural elements is very dangerous, since the increasing selfheating temperature intensifies the initiation and propagation of fatigue damage, and may significantly shorten the residual life of such elements. Following this, it is necessary to control this process. The theoretical models developed to date may be inaccurate in predicting the residual life of a structure subjected to fatigue with the appearance of self-heating, especially after the initiation of structural damage. Therefore, the authors proposed the empirical model based on estimating the parameters from the self-heating temperature profiles with statistical analysis of these parameters, which allows one to determine the estimators and predict the residual life of composite structures working in such conditions in more accurate way. The paper presents an experimental and numerical study investigating the load carrying capacity of thin-walled composite structures with an omega-shaped cross-section subjected to axial compression. The tested profile was made of carbon-epoxy laminate with symmetrical arrangement of the layers [0/90/0/90]s. The experimental tests were performed on a universal testing machine - Zwick Z100, under full load conditions until total failure of the structure. The post-critical equilibrium paths of the construction were determined, defining the relationship between compressive load and deflection and enabling the FE models to be validated. Based on the obtained post-critical equilibrium paths, the critical load of the construction was determined using well-known approximation methods. Simultaneously, numerical analysis was carried out by the finite element method using Abaqus® software. The critical state was determined via linear eigenvalue analysis, and the critical load and corresponding first buckling mode were estimated. The next stage of numerical analysis involved solving the nonlinear stability problem of the structure with initialized geometric imperfection reflecting the first buckling mode of the composite material. The geometrically non-linear problem was solved by the Newton-Raphson method. The load capacity of the composite profile in the post-buckling state was determined by the progressive failure criterion which estimates damage initiation in the composite material using the Hashin criterion. Progressive failure analysis is described with the energy criterion describing the stiffness degradation of finite elements. The obtained numerical simulation results showed very high correspondence with the presented experimental results conducted on real structures, which confirms the precise preparation of the developed numerical models of the composite structures. The subject of the experiment and numerical research is a simply-supported thin-walled box beam with a span of 2.00 m, created by gluing two composite GFRP shells. The beam was subjected to a three-point bending test controlled by displacement in the range from 0 to 300 mm. An experimental bending test, numerical modelling and simulations of this test as well as validation of the modelling and simulation were carried out. In comparison with the authors’ previous publication, adjustments and enhancements include: correction of the GFRP material constants and friction coefficients; testing the key numerical parameters of the geometrically and physically non-linear task, i.e. an iteration step in the implicit algorithm, a convergence tolerance coefficient, FE mesh density; testing the use of the Glue contact option in the MSC.Marc FE code for modelling adhesive joints; quasi-optimization of the ply sequence with the maximum load bearing capacity as the objective function. The parameters and options of numerical modelling and simulation of glued composite shells in the MSC.Marc system were determined, useful for detailed design calculations of composite FRP structures. The development of a sintered copper matrix composite with a small addition of carbon nanotubes (CNTs), which improves its mechanical strength without a decrease in electrical conductivity is of practical importance. Therefore, in the present paper the parameters of ball milling of a Cu+CNT powder mixture were optimized in order to obtain the highest refinement of particles of such a composite material. Investigations carried out with the help of scanning electron microscopy and sieve analysis revealed that the average particle size of the powder decreases with an increase in the volume content of the carbon nanotubes. The presence of carbon material should limit grain growth during the hot pressing of composite material, allowing much smaller grain sizes and accompanying high hardness to be obtained of the resulting compacts, as compared with similarly processed copper powder. At present due to the emergence of new methods of synthesising starting powders and their consolidation, Al2O3 based high-strength ceramic materials toughened by ZrO2 (ZTA) are widely used as structural materials for various purposes. It is known that the material properties depend on the properties of the starting powders. Combined methods of powder preparation essentially extend the possibility to vary the powder properties. The purpose of this work is to produce a finegrained powder of the composition (mol%) 58.5 α-Al2O3 - 41.5 ZrO2 (Y2O3, CeO2) by a combined method (hydro-thermal synthesis in an alkaline medium/mechanical mixing). The resultant fine-grained powder was heat-treated at 400, 550, 700, 850, 1000, 1150, 1300, and 1450°C with holding for 2 hours at each temperature. The properties of the synthesized powders were characterized by differential thermal analysis (DTA), scanning electron microscopy (SEM), X-ray diffraction (XRD) and specific surface measurements (BET). The microstructural and phase analyses were conducted by petrographic study. The powder morphology varies continuously topologically. The agglomerates after mechanical mixing had an irregular shape up to 1450°C. A tetragonal solid solution based on ZrO2 (T - ZrO2) and α-Al2O3 was identified in the powder after mechanical mixing. T-ZrO2, as well as a monoclinic solid solution based on ZrO2 (M-ZrO2) and α-Al2O3 were identified after heating at 1450°C. The research results will be used for the microstructural design of ZTA composites. A method was developed to manufacture Ti3SiC2 MAX phase preforms characterized by open porosity. Samples compacted from elemental powders of Ti, SiC and C with the molar ratio of 3:1.2:1 were heated and synthesized in a microwave field under atmospheric pressure. As this particular composition of elements exhibits rather low reactivity, it was necessary to apply the “coupled” mode of the SHS method. The initiated synthesis first proceeded with the formation of Si-Ti intermetallic and TiC precipitates, whose highly exothermic reactions resulted in a significant increase in temperature to ca. 1800°C. Next, these phases were almost completely transformed into a plate-like Ti3SiC2 MAX phase forming the porous structure of the samples. Although the majority of the synthesized material consisted of Ti3SiC2, some inclusions such as TiSi2, TiC and SiC were also found and identified in the material by the means of scanning electron microscopy and XRD analysis. The manufactured preforms can be used for components working in extreme conditions (heat exchangers, catalyst substrates, filters) or as a reinforcement for composite materials. The presented work is a continuation of tribological research on alumina/graphene composites. In our previous publication the results of wear tests on the above mentioned composite at room temperature, but also at temperatures of 150, 300 and 500°C were presented. The studies showed that this composite is promising in relation to pure alumina at ambient temperature and 150°C. In order to determine more precisely the temperatures at which the tested material can work, abrasion tests were carried out at two additional temperatures, 80 and 200°C, and the results are presented in the following paper. Noticeable plastic deformation and wear greater than at room temperature was detected already at 80°C but it was still significantly lower than at 150°C when the composite wore significantly less than pure alumina. The test carried out in 200°C gave results similar to those for 300°C, which indicates significant degradation of the material at this temperature. The aim of the conducted research was to determine the effect of filler in the form of microspheres from fly ash being a product of bituminous coal combustion on the functional properties of polyethylene. Comparative analysis of unfilled polyethylene and polyethylene with additions of 5, 10 and 15% (wt.) fly ash from bituminous coal was carried out. Tests of the mechanical properties were performed: tensile strength, hardness determined by the Shore method and the ball indentation method. Color and gloss analysis was also performed. On the basis of the conducted tests, it was found that the modification of polyethylene with fly ash from coal combustion has a significant impact on the functional properties of the tested materials. The molded parts from unfilled polyethylene exhibited the lowest value of hardness, while the largest value of hardness was obtained by parts made of polyethylene with 15 wt.% filler content. The content of fly ash from bituminous coal combustion also affects the tensile strength and elongation of the tested materials. As the filler increases, its tensile strength decreases. As a result of the addition of the filler, changes in the coordinates describing the color, as well as a reduction in the brightness value and a reduction in the gloss degree for the angles of incidence of 60° and 20° were noted. The presented research results indicate that producing polyethylene composites with the addition of microspheres from fly ash originating from bituminous coal combustion gives the possibility to obtain composites with significantly better mechanical properties as compared to unfilled polyethylene. The use of fly ash from the combustion of bituminous coal as a filler results in obtaining an inexpensive filler compared to fillers used in industry today. At the same time, it contributes to reducing the amount of waste generated from the combustion of bituminous coal. The test results give the possibility to use the composites produced in various industries as a raw material for the production of various engineering elements. In the article, a new composite was studied as a potential biomaterial. The effects of the interaction of distilled water with the polished surface of an AZ31 magnesium matrix composite reinforced with open-celled glassy carbon foam fabricated by the pressure infiltration method were investigated. The experiment was conducted in the time range of 1 minute - 4 hours and the microstructure was examined by scanning electron microscopy. In the initial unetched material, at the glassy carbonmetal interface, a zone of needle-like phases was detected. After a 1÷10 minute interaction with the water, disintegration of that zone was revealed and that type of material degradation proceeded deeper into the composite as the time increased. Another type of corrosion was observed in microareas of the magnesium alloy matrix, but only after approx. 1 hour when corrosion pits were recorded. The results of X-ray mapping showed an increase in the oxygen concentration in both types of corrosion products, but the reason for the corrosion in the region between the carbon foam and the AZ31 matrix is degradation of the hydrophilic aluminium based carbide phases, while in the composite matrix, typical electrochemical corrosion of magnesium occurred. The paper presents a description of preliminary trials of covering glass-ceramic fibers with polymer resins intended for new fiber optics claddings. It occurred to be impossible to obtain a polymer film on the fibers without the effect of forming droplets using an epoxy resin with a relatively low viscosity (0.58 Pa•s). Reducing the thickness of the applied film by immersing the initially covered fiber ina solvent allowed the authors to obtain a uniform thin coat of 0.25 μm, which is too small for the practical application. Applying a gel-coat (high viscosity) as a covering liquid allowed a high thickness coating to be obtained. However, the thickness was very inhomogeneous - it varied from 2 to 30 μm. The most promising coating was gained with an acetone-based dispersion of ceramic powders with a viscosity of 0.8 Pa•s. It allowed the authors to obtain a coating thick enough to be technically applicable (> 10 mm), without the presence of droplets. This is an important guideline for further work on obtaining claddings for new optical fibers. The obtained results show the importance of viscosity and internal cohesion of the applied liquid for the effectiveness of its application to a solid base. Modifying the viscosity of liquids can in many cases be a technically simpler solution than improving wettability between the liquid and the given base. The paper presents a method to determine the thermal conductivity of composite insulating materials containing ceramic microspheres, in which there is a vacuum. The matrix of the tested composite is acrylic resin, and the strengthening phase is ceramic microspheres. Preparing of samples from such material for testing in a plate apparatus is difficult due to damage to the spheres during processing and the formation of air gaps between the plates. The described method uses the amount of electricity consumed by the water heaters to maintain the set temperature. The essence of this method is to compare the energy consumption of the tank coated with the tested composite material with that by an identical tank coated with an reference insulation with a known thermal conductivity (PUR). A necessary condition is a similar drop in temperature on the test and reference insulations. The development of a new deposition method allowing to obtain thick composite coatings is of both scientifically and practical importance. The one presented in this paper is based on a negative side effect taking place during the mechanical synthesis of alloys, i.e. sticking of milled material to the surfaces of both the vial and balls. The experiment covered the comilling of NiAl (~45 μm) with 15 wt.% CrB2 (~40 μm) powders together with nickel platelets used as the substrates and steel balls. The above processing performed at 200 rpm resulted in a steady increase in the thickness of the rubbed-in buildup on the platelet surfaces allowing coatings of 4, 11, 22 and 33 μm to be produced after 4, 8, 16 and 32 hours. The OM, XRD and TEM investigations showed that such coatings are characterized by a gradient microstructure with heavily dislocated but coarser grains near the substrate and a more porous inner part formed with rounded well fused agglomerates of greatly refined crystallites. The CrB2 were only slightly larger than the NiAl ones and were distributed quite uniformly. Most of the coating was found well fused with the substrate, but occasional voids and porosity at the substrate/coating interface were also noted. It is worth noting that applying the proposed method allowed the authors to produce a thick, gradient and mostly nano-crystalline NiAl and CrB2 composite coating. The paper compares the influence of the type and number of composite reinforcement layers on the impact resistance, as well as the effect of the matrix type. Carbon, aramid and carbon-aramid fabrics were tested, and block copolymer styrene-butadiene-styrene and epoxy resin were also tested. In addition to impact tests, investigations were also carried out on the adhesion of the coatings, without reinforcement and with one layer of fabric, to the steel substrate. The highest values of pulloff strength were obtained for the coatings based on the SBS copolymer reinforced with fabrics. In the case of the coatings reinforced with aramid and aramid-carbon fabric, both adhesive and cohesive damage occurred during the pull-off test. Alumina materials are of great interest due to their high wear resistance, resistance to corrosion, high strength and low friction. However, studies show that a graphene addition can significantly reduce wear and friction. Even a small addition of platelets results in noticeable changes in the material properties. The presented work describes the results of the ball-on-disc test conducted on two friction pairs: alumina-alumina and alumina/graphene composite - alumina. The tests were conducted at four temperatures: 20, 150, 300 and 500°C in air. Surface profile geometry measurements after the test were used to determine the wear rate. Observation of the surface microstructure after friction was carried out using a scanning electron microscope. The tests showed improvement in the wear resistance and a decrease in the friction coefficient of the composite tested at room temperature compared to pure alumina, while the use of elevated temperatures adversely affected the composite. The application of silica-based fillers for polymers and nanocomposites is a subject of extensive research, mostly due to the demand for new materials of improved physicochemical, mechanical or thermal properties. In this paper we present a new, one-pot sol-gel (OPSG) method to synthesize fillers for polyolefins. The developed method assumes direct synthesis of the filler together with its modification upon the addition of organofunctional silane. It allows fillers with controlled porosity and hydrophobic properties to be obtained, which undergo better dispersion in a polymer matrix. The characteristics of the obtained composites were defined by thermal analysis, as well as tensile and impact tests. The contact angle was measured by the sessile drop technique to determine the hydrophobic-hydrophilic properties of the fillers. Morphological analyses were performed using SEM, surface area and pore volume measurements. The one-pot method is a preferred alternative to the multi-step synthesis methods for synthetic fillers. The work explored the possibility of producing Al2O3-Ni gradient composites using non-absorbent molds in a high-speed centrifuge. As a result of the centrifugal force, the mass was compacted and the solvent was separated from the solid part. The influence of rotational speed and the change in the solid phase content in the slurry on the obtained microstructure of the composites was investigated. The produced composites were characterized on the basis of macroscopic observations of the obtained samples immediately after the casting process (green body) and after the sintering process. To determine the gradient of the metallic phase, the observations were made on cross sections of the samples. Densification of the sinters was determined by the Archimedes method. The obtained results showed that using an appropriate correlation of technological parameters, i.e. rotational speed and solid phase content in the slurry, enables the fabrication of Al2O3-Ni composites with a microstructure gradient by the centrifugal casting method using non-absorbent forms. It was found that with an increase in the solid phase content in the mass, a clear boundary is formed which separates the area containing only ceramic (Al2O3) and metallic (Ni) particles. The study presents research on the influence of the size of solid lubricant inclusions-graphite on the properties of pressureless sintered SiC-graphite composites. The purpose of these composites is to achieve a self-lubricating effect between the working elements of a friction seal. For this purpose, studies were carried out, on the basis of which the composite with the inclusion size that provides the optimal mechanical andtribological properties was selected. The apparent density, hardness, bending strength, abrasive wear resistance, friction coefficient and linear wear in contact of the same kind of material pairs were determined. Mechanical and tribological tests were correlated with qualitative and quantitative microstructure analyses, on the basis of which it was found that SiC-graphite composites with inclusions not larger than 0.056 mm meet the requirements for the materials used to produce self-lubricanting elements of face seals. It was then observed that small inclusions of graphite are more uniformly distributed in the SiC matrix. This work describes polyester matrix composite materials with diversified reinforcement materials, namely glass, carbon, and a natural material (jute). These reinforcement fibres were utilised in the form of fabrics with a canvas-like weave and basis weight ranging from 300÷400 g/m2. The mass fraction was uniform in each of the materials that were produced, namely 40% of the baseline in comparison to the materials that were subjected to testing. The composites were produced by the vacuum pressure infiltration method, RTM (resin transfer moulding), thereby creating laminates. To assess the mechanical properties of the composites, static tensile strength tests were carried out according to PN-EN ISO 527-1:2016; the bending strength was determined according to PN-EN ISO 178:2011, and the impact strength was tested by the Charpy method according to PN-EN ISO 179-1:2010. The density of these composites was determined by the hydrostatic method according to standard PN-EN ISO 1183-1:2013-06. The aim of this paper is to present synthesis and characterization routes of hybrid polyurethane viscoelastic foams reinforced by - inorganic nanoaddities. Recently, much attention has been given to polymer nanocomposites made with POSS (Polyhedral Oligomeric Silsesquioxanes) - a family of siloxane material consisting of inorganic silicon-oxygen core and organic functional groups. Functionalization of POSS enables formation of chemical linkages with polymer matrix and increases compatibility between the organic and inorganic components. Our research focused on the modification of polyurethane materials by functionalized POSS. Octa(3-hydroxy-3-methylbutyldimethylsiloxy) POSS containing eight hydroxyl groups and 1,2- propanediolisobutyl POSS with 2 hydroxyl groups were chosen as additional co-reagents which were mixed by ultrasound homogenizer in polyol phase. POSS was added in amounts 5, 10 and 15% by weight of polyol, and reacted with diisocyanate (TDI) to obtain PU/POSS composite. The effects of incorporation of POSS on the mechanical properties of PU-based hybrid composites were presented. Moreover, the morphology of PU/POSS hybrids was investigated by means of wide-angle X ray diffraction (WAXD) and scanning electron microscopy (SEM) techniques. The article describes the course and results of research on a composite laminate. Specimens were made from glassreinforced epoxy resin using the hand lamination technique with the fibres arranged unidirectionally along the specimen. The dimensions were selected on the basis of DIN EN ISO 14125. Strain gauges were placed on the surface of every specimen, then testing was conducted - three point bending. The specimen was placed so that the strain gauge was at the stretched side during bending in order to measure the strain. The stress was also calculated analytically, based on the process parameters. As a result, the theoretical stresses were compared with the experimental ones. The study describes the results of tensile strength tests of hybrid laminates composed of thin titanium layers and glass and carbon fibre reinforced polymer layers. The tests were conducted at −120, RT (23°C) and 85°C. The tests allowed the basic mechanical properties to be determined, including: tensile strength, Young's modulus and strain at failure. The tests proved that as the temperature decreases, the strength of titanium/glass fibre reinforced polymers increases by 21 to 26% depending on the configuration, while the strength of titanium/carbon fibre reinforced polymers decreases by 6 to 8%. The Young's modulus values for all the tested systems increase by 3 to 7% as the temperature drops. A different tendency was observed regarding the strain at failure which decreases by 1 to 11% as the temperature drops. The tensile strength test results for the increased temperature (85°C) differ only slightly from those obtained at room temperature. The macroscopic analysis of the failed specimens revealed the existence of characteristic, prevailing forms of failure, namely breaking fibres, matrix cracking, including delamination and permanent deformation of the titanium layers. The paper presents the preliminary results of studies on obtaining copper-based composite materials strengthened with silicon carbides. Electrolytically obtained copper powders were used as the matrix. The sinters were characterized by different SiC contents (0, 5, 10, 15 wt.%). The materials were consolidated by one-sided pressing followed by sintering (T = 800°C, t = 1 h). One-sided pressing was carried out at the pre-set pressing pressure of 60 kN and at the rate of 200 N/s. The research was performed on powders, mouldings and sinters. Investigations of the composites comprised: microscopic examinations (SEM), chemical composition analysis (SEM), XRD measurements, the density of the composites was determined, and a quantitative evaluation of the porosity of the composites was carried out. The paper discusses and attempts to analyze the impact of the method of forming fibrous composite materials on the quality of the laminates. The model assumes that the composite consists of components having individual physico-mechanical properties with a symmetrical structure [0/90/0/90]s. This article uses experimental data of a contact-formed composite (Composite I) and a vacuum bag composite (Composite II) with a polyester matrix (Firestop 8175-w-1) reinforced with E glass matte fabric. Before the samples were cut, the parameters and technological criteria of the formed composite were determined such as the amount of resin and soaking time of the composite reinforcement with the polymer resin. The influence of matrix plastification and a more packed structure in the produced composites on the scale effect (for samples with larger and smaller measuring bases), the dispersion and mean value of strength from the time of aging were determined. Fireproof textiles must exhibit high heat resistance. Many methods to improve this property are known. They can be achieved, for example, using special chemical additives during fiber production. In the paper the use of a nanocomposite layer is proposed. NATAN and PROTON fireproof textiles were coated with a TiSi(N) nanocomposite layer using magnetron sputtering technology. Three layer thicknesses of 200, 300 and 400 nm were applied. The thermal barrier effect for heating up to 100 and 330°C was studied on specially designed testing equipment. The influence of the layer thickness on the textile heat resistance was visible at 100°C. For the thickest layer a worse effect was observed, which could be caused by the thermal conductivity of the composite layer. However, the proposed layer raised the heat resistance of the textiles. In the present paper, a new approximate analytical formula for the effective conductivity of 2D dilute composites with poorly conducting circular inclusions and cracks on the interface between the inclusions and the matrix is established. This formula is proved by Maxwell's approach and Keller's identity using advanced complex analysis. The obtained formula is used to determine the effective thermal conductivity of a composite material being an aluminum matrix based on Al-Mg-Si alloy reinforced with Al2O3 particles with the average size of about 25 microns and a volume fracture of 20%. The computer simulations results are presented in tables and illustrated by figures. It follows from the derived formulas that cracks reduce the effective heat conductivity about 9% with respect to the material without cracks. The preparation of powder agglomerates used in the plasma spray deposition processes, and especially their homogeneity, turned out to be highly important at the moment when the phase ratio in the composite coatings began to differ from that in the starting materials. The present experiment was aimed at comparing the microstructure and phase composition of hot pressed or sintered NiAl and CrB2 powders. The use of SEM and XRD methods showed that only sintering leads to a reaction of the chromium diboride with the intermetallic matrix. As a result of this process, Ni0.5Cr1.5B3 phase precipitates on the CrB2 particles. Consequently, the agglomerates formed after crushing the compacts obtained by sintering are much more homogeneous than those formed by hot pressing. The article presents the fundamentals of the manufacturing, structure and selected properties of composite coatings (RGC) developed at the Silesian University of Technology designed for the aviation industry. The tribological properties of the developed coatings were compared with the properties of coatings used to date (TLML). The primary purpose of the coatings developed by the authors is to extend the time of correct operation of selected contacts of aircraft piston engines after the loss of lubrication due to a failure during flight. This time is necessary to fly to a safe landing place. Ensuring correct operation of the contact, i.e. maintaining the coefficient of friction at a level to prevent seizing, is possible due to a coating of a composite layer containing solid lubricants on the sliding surfaces. In the RGC coating, it is a glassy carbon and in the TLML coating it is molybdenum disulphide. During sliding with an insufficient amount of oil, more intensive wear of the coating takes place. Since the lubrication does not work, wear products are removed from the friction zone much more slowly. A mixture is formed from the wear products of the solid lubricant and oil residues, which is deposited on the cooperating surfaces, reducing friction. Even after the coating was worn off, the coefficient of friction in the conducted tests did not exceed 0.04. The developed coating can work at 120°C, with pressure p = 0.4÷2.0 MPa and at sliding velocity v = 0.55 m/s up to 30 minutes without being completely worn out. The TLML coating after about 24 minutes was worn out. In this work results of the preparation of bentonite/nAg nanocomposites were presented. In the first stage, the bentonite sorption properties were determined, including the equilibrium and kinetics parameters of the sorption process of silver ions on the bentonite. The study analyzed the filler sorption properties for different concentrations of silver ions in solution. The equilibrium sorption data were analyzed using Freundlich, Langmuir and Temkin equations. It was found that the best fit is given by the Freundlich equation. Analysis of the kinetics of the sorption process showed that the pseudo-second-order equation was characterized by the best fit for the experimental data, suggesting the chemical character of the adsorption process. In order to obtain a nanocomposite, silver ions contained in the composite were subjected to a reduction process using tannic acid with stabilizing and reducing properties. The obtained bentonite/nAg nanocomposites contained silver nanoparticles in the range of 162÷266 mg/g. The structures of the nanomaterials were studied by XRD and SEM methods. The article presents the issues of recycling materials made of plastics and composite materials based on a plastic product. The way of preparing samples made of polyester resin being the matrix with cotton, jute and glass fibre reinforcement was described. Moreover, the results of combustibility property tests of the prepared composite materials were shown. The studies were carried out according to the UL 94 standard, used by American Underwriters Laboratories. The results of the tests were presented in the form of final conclusions. The self-heating effect occurring during the cyclic loading of materials that exhibit thermoviscoelastic properties, depending on the loading conditions, may develop according to two possible scenarios: stationary and non-stationary. Since stationary self-heating has not been not previously studied in terms of the criticality of the self-heating effect, it is essential to perform such a study to better understand the degradation processes in this scenario and to confront the results with the criticality of non-stationary self-heating. In the present study, the experimental results on fatigue testing following the stationary self-heating scenario are presented and discussed. In order to characterize the degradation process, both self-heating temperature distributions and their evolution as well as acoustic emission measured at various self-heating temperature ranges were analyzed. The obtained results allow the influence of the self-heating effect on the residual life of composite structures under the stationary self-heating scenario to be estimated. In this work the microcrystalline cellulose (MCC) filler was chemically modified by esterification with succinic anhydride (SA) in order to improve the compatibility of MCC with the hydrophobic polymer matrix. The effect of the microwave irradiation and conventional heating on the chemical structure, particle morphology and thermal stability of the cellulosic filler was evaluated by FTIR/ATR, TGA and light microscopy. The extent of surface modification of microcrystalline cellulose gradually increased with an increasing reaction time up to 90 min, and the effect was significantly pronounced under microwave irradiation as compared to conventional heating. A decreasing decomposition temperature was observed for the samples modified with SA as compared to the reference sample as a result of introducing functional side groups into the cellulose backbone and developing the surface of the MCC powder. A decrease in MCC particle sizes was observed as a result of chemical modification, especially under microwave irradiation, indicating partial hydrolysis of the amorphous regions of cellulose in an acidic environment. Smaller particles can be more equally dispersed in a polymer matrix. Applying microwave irradiation enhanced the efficiency of surface modification and produced MCC with a wider range of surface properties. Microcrystalline cellulose with adjusted surface properties can be applied as a reinforcing filler for fully biodegradable ‘green’ composites. A method was developed for manufacturing Al-Si alloy matrix composites reinforced with MAX phases by squeeze casting pressure infiltration of porous preforms. MAX phases in the Ti-Al-C system were synthesized using self-propagating hightemperature synthesis (SHS) in the microwave assisted mode in order to obtain spatial structures with open porosity consisting of a mixture of Ti2AlC and Ti2AlC i Ti3AlC2. The manufactured composite together with a reference sample of sole matrix material were subjected to the testing of thermal properties such as: thermal conductivity, thermal diffusivity and thermal expansion in the temperature range of 50÷500°C, which corresponds to the expected working temperatures of the material. The specific heat and mass change during heating were also established by means of thermogravimetric analysis. The obtained thermal conductivity coefficients for the Al-Si+Ti-Al-C composite were higher than for the sole MAX phases and equalled 27÷29 W/m•K. The thermal expansion values for the composite material were reduced two-fold in comparison with the matrix. The work develops the original methodology of design calculations for GFRP composite box footbridges. This methodology was applied to the original structural solution of a composite pedestrian-and-cyclist bridge with a 12.00 m span length and a 2.50 m platform width. The footbridge structure includes a number of original solutions regarding the superstructure, crosssection, bearings, reinforcement of support zones, transverse braces, balustrades, and railing post-platform connections. The design criteria for a GFRP composite footbridge were formulated based on the latest national standards for the design of footbridges made of conventional materials (steel, concrete) and the standard for the design of GFRP laminate tanks. The ultimate criterion for the composite superstructure was formulated using the Hashin-Fabric failure criterion and a global map of the effort index. Moreover, the serviceability criterion for the vertical deflections of the superstructure, pedestrian comfort criterion and global buckling criterion were developed. The advanced numerical modelling and simulations of the footbridge were carried out using MSC.Marc FE code. The modelling and simulation methodology, as well as the results of identification and validation tests published in the previous works by the authors were used. The results of simulation of the ultimate, serviceability and buckling limit states, corresponding to the adopted ply sequences of the laminates in the individual GFRP shells, are presented. Due to the fulfilment of all the criteria with significant margins, further numerical analyses of a footbridge with fewer laminations and design according to the Eurocodes are purposeful. The paper presents the process of producing composite material by the vacuum bag method and its numerical analysis. The composite is made of three layers of two-directional combimat with a [0.90] orientation. Then it is cut at angles and subjected to a tensile test in the Laboratory of Composite Materials, Kielce University of Technology. The data obtained from the tensile test were used to construct three tubular elements that were designed in the ABAQUS program using the finite element method. The tube was treated as a thin-walled shell component, at both ends infinitely rigid rod-shaped Rigid links are formed, at the center of their intersection the point of attachment is generated. On both sides of the rigid restraint, the element is subjected to a uniform internal pressure of a 10 MPa amplitude, which would be very difficult to obtain under laboratory conditions. The conducted experiment gives very precise information about the stresses created in the composite and the behavior of both the fibers and the matrix at different layup angles. The paper presents the results of friction and abrasive wear measurements of composites in the α-alumina/tetragonal zirconia system. Two types of materials with mutually interpenetrating phases in a continuous manner were investigated. Pure alumina and zirconia samples were used as the reference materials. Ball-on-disc tests were conducted at 20 and 500°C. An alumina ball was applied as the counterpart. The tests showed that the composites have a significantly reduced wear rate and friction coefficient when compared to monophasic materials. Improvement of the properties was noticeable especially at the elevated temperature. The aim of this work was to fabricate Al2O3-ZrO2-Ti composites by slip casting and to analyse the influence of a pure titanium addition on the microstructure and density of the composites. For this purpose, two groups of samples were prepared by slip casting, with and without titanium. Experiments were performed using the samples: Al2O3 + 10 vol.% ZrO2 and Al2O3 + 10 vol.% ZrO2 + 10 vol.% Ti. The composites were characterized by XRD and SEM. Moreover, the density was measured using the Archimedes method. The hardness was measured as well. The obtained composites had a homogeneous microstructure and high relative density. It was found that a phase transformation in ZrO2 occurred. The titanium content as a ductile phase can slightly reduce the Vickers hardness of the composites.